URLs are a visible part of the web and everything we see, influences us. That is why it is a good idea to brand your URLs. 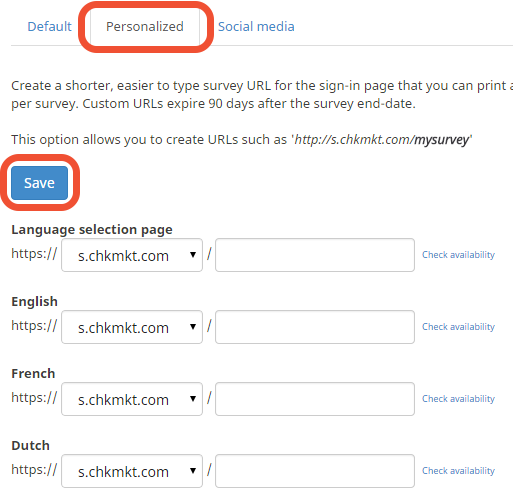 You can easily brand CheckMarket survey URLs. There are a few options. Go to the Distribute overview. Email – Send with your own email system: Click on Survey URL – email. Paper – Contacts: Click on Sign-in page URL. Paper – Non-contacts: Click on Survey URL – Paper. Web – Link: Click on Survey URL. Select the domain of your personalized URL. Check whether the chosen URL is available by clicking on Check availability. You can brand your URL even further than a personalized URL. You can ask CheckMarket to arrange a ‘Third level’ domain for you. These URLs follow this pattern: https://[yoursurvey].chkmkt.com. As previously mentioned, the chosen URL has to be available. To utilize this service, please contact our support team. They will send you a tender and after you’ve confirmed the costs arrange everything for you. You can also ask CheckMarket to set up an entirely new domain for your survey. This will definitely put your brand in the spotlight. URLs will then follow the pattern: http://[yoursurvey].com. You can even decide which extension you would like to use. Of course, the domain you want to use, needs to be available. Please contact our support team for a tender. After you’ve confirmed the costs, they will also make all necessary arrangements for you. TIP! We can link your domain name or ‘third level’ domain to your survey or your account so all emails are sent from this domain. In all the links from and to your survey ‘CheckMarket’ will be replaced by your chosen domain. How do I use my own domain name for my surveys?